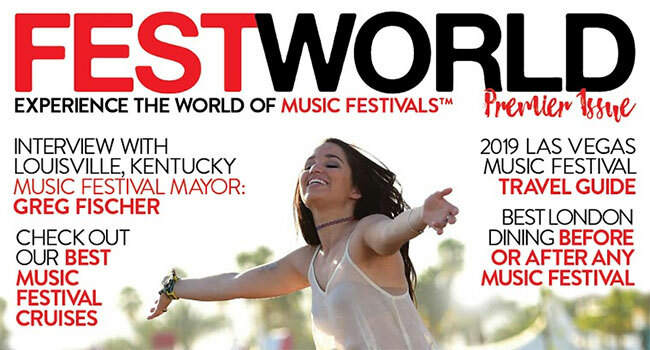 FestWorld Magazine, the world’s first print magazine devoted exclusively to music festivals and music festival fans, will launch on March 9, 2019. The quarterly magazine will feature engaging and informative exclusive-to-print content related to every aspect of music festivals — from travel and food to fashion, art, and, of course, music. FestWorld Magazine will be available at airports and music festivals across the globe. “If you want to see humanity at its best, attend a music festival. A print magazine fits right into the festival ethos, which is rooted in travel, adventure, and new friendships,” states founder Scotty Moore. Moore, an entrepreneur with more than 20 years of print and digital media advertising experience, is the founder of FestPop.com, the first website dedicated to music festival discovery and providing a full-service travel booking platform. Each issue of the magazine will be 136+ pages, with 38 pages of advertising, have a guaranteed circulation of 350,000, and a $5.99 cover price. Each issue of FestWorld Magazine will feature eight key editorial anchors including reviews, travel guides, artist interviews, producer interviews, fashion and art, and food and essentials. An annual subscription costs $12 with $2 from each one going to help the opioid epidemic. “It makes sense to have a magazine dedicated to the festival culture that has become such a part of so many lives,” comments Kevin Lyman, founder of Warped Tour and FestWorld partner organization Full Energy, No Drugs (FEND). Kevin Lyman recently received Billboard’s Humanitarian Award in November 2017 for his work with anti-opioid initiative FEND (“Full Energy, No Drugs”). The FEND app uses gamification to educate youth on the dangers of drugs. With FestWorld Magazine, Moore and his team of magazine industry heavyweights aim to make a difference. He has created the FestWorld Foundation, which is dedicated to combating the opioid epidemic. Opioid addiction and misuse is devastating families and communities and according to the U.S. Centers for Disease Control and Prevention, on average 115 Americans die every day from an opioid overdose. The mission of the foundation is to serve communities on the ground level by supporting treatment and recovery response efforts while simultaneously contributing to research and education. The FestWorld Foundation will support the efforts of FEND and National Opioid Action Coalition (NOAC), WPP, iHeartMedia, and Fors Marsh Group initiative that complements existing state and federal government efforts to help drive measurable results in prevention, treatment and/or recovery for communities and individuals affected by the opioid crisis.